Michael Fassbender and Marion Cotillard star in Macbeth. “Life’s but a walking shadow,” laments Macbeth in the famous soliloquy from Shakespeare’s drama. People generally quote the “sound and fury” part of this same speech, but the significance of this line of the verse feels especially relevant to Justin Kurzel’s inspired adaptation of Macbeth. This dark and nightmarish take on the Shakespearean drama is like a foreboding reverie or a fever dream told in the elliptical rhythm of iambic pentameter. Macbeth plays like a walking shadow under Kurzel’s direction: it resembles a somnambulant death march, a sleepwalk over fire, and a dream from which one cannot escape. Adaptations of Shakespeare’s Macbeth are too few and those that do make it to the screen generally don’t do the epic tragedy justice. However, this Macbeth makes amends for the dearth of quality pics about the tormented Scottish king and his scheming wife. The film chiefly benefits from two terrific performances by Michael Fassbender and Marion Cotillard as Macbeth and Lady Macbeth, while the sumptuously evil aesthetics of the film are visual poetry for Shakespeare’s verse. This take on Macbeth heavily favours the visual power of the film, so Macbeth branches away from classically composed Shakespeare films (ex: Olivier’s Hamlet) and instead offers something comparable to Julie Taymor’s Titus (although not quite on the same level) as Kurzel devises rhythms, palettes, and imagery to convey the meaning of the text. The film begins with an epic battle at Cawdor that is bold, brutal, and bloody. Kurzel plays out the battle akin to Orson Welles’s war scenes in Chimes at Midnight by preferring the roughness and grit of combat, rather than the glory that Shakespeare’s text and straightforward Shakespeare adaptations usually evoke. Blow for blow action creates images of cold, ruthless deaths as Fassbender’s Macbeth proves himself a wicked beast as he wields a sword amongst the carnage and watches men die. The nightmarishness of Macbeth arises immediately in these images as Kurzel draws out the action in hypnotic slow motion. The action feels removed from time—indeed, Shakespeare’s work is timeless—and apart from reality as Macbeth finds himself as the precipice of two worlds. The battle borders the world of the witches who conjure Macbeth’s fate with their familiar spell of “Fair is foul and foul is fair.” The witches, played by Lynn Kennedy, Seylan Baxter, Amber Rissman, cover three generations of sorcery. The witches appear fleetingly on the periphery of the film’s action and the film gives the sense that they control time and fate as Macbeth watches the witches while men do battle around him at a slower pace. Macbeth opts for slow motion a bit too much, for while the effect daringly adds major dramatic heft and atmosphere to the battle, it becomes somewhat tiresome as Kurzel manipulates the images to play like fleeting shadows atop the sound and fury of the Shakespearean verse. The style remains somewhat effective throughout the film, though, as it puts Macbeth is a limbo of sorts as Macbeth and Lady Macbeth descend into madness following Macbeth’s murder of King Duncan (an excellent David Thewlis) and coronation as King. The film evokes the delirium of power and the weight that the crown carries as the drama becomes less lucid the more Macbeth crumbles under his own guilt. The bravura cinematography by Adam Arkapaw favours the bold with oodles of red that make the film awash in blood and tragedy. This Macbeth looks as if it transpires on Mars as much as it does on the hills of Scotland, and the surreal atmosphere is richly innovative, as are the ingenious costumes by Jacqueline Durran that intertwine elements of history and science fiction. The adaptation’s shrewdest image, however, is one that precedes all the battles, slow motion, and action. This Macbeth opens with an image of a dead child, a young and slightly blue-ish babe wrapped in clothe, as Macbeth and Lady Macbeth lay the baby to rest and bury him. The dead child is only an implication in the play, but the film directly signals a coldness and a rift between the married couple before the real drama begins. By preluding the film with the dead child, Macbeth wraps the events that ensue within the tragedy of a stillborn marriage. There’s not an ounce of love anywhere to be felt between Macbeth and his Lady, and this emotionlessness greatly weighs the dynamics of their relationship. The casting of French actress Marion Cotillard, similarly, positions the marriage between Macbeth and Lady Macbeth as a purely transactional affair. It’s the product of an alliance between the Scots and the French with Lady Macbeth serving as the prize, dowry, or peace offering. She’s as much a power hungry animal as her husband is, and the film salaciously lets the Macbeths hatch their plan to assassinate Duncan, as Macbeth is mid-thrust in Lady Macbeth and the two get off on their thirst for power. The film also likens Lady Macbeth as a member of the witches’ coven as Cotillard frequently appears more alien than medieval with Lady Macbeth’s Medusa-meets-Princess-Leia hairdo and funky make-up. The actress ferociously tackles Shakespeare’s verse with icy resolve and intimidating authority. Cotillard’s Lady Macbeth is a woman who lives deliciously on the blood of others. Throughout the film, Lady Macbeth seems in control of the balance of power until her own guilt cripples her quickly and fleetingly like a bad potion consumed as an exit strategy. The film intuitively resurrects the ghost of the dead Macbeth baby for Lady Macbeth’s spotlight “Out, damned spot” line, which she delivers alone while staring vacantly and longingly at an image off-screen. Cotillard, too, resurrects the ghost of a woman undone by power who desires the life she could have had. As she crumbles under the burden of guilt and regrets, Cotillard’s excellent performance evokes a layer of humanity the character rarely receives. Fassbender similarly gives a unique reading of his tragic character. This take on the king channels the spirit of Hamlet as Macbeth first takes an aloof step towards madness. As Macbeth sees the first of the spirits who come to haunt him, his madness resembles both a ruse and the real deal. Cotillard steals the scene in this moment as Lady Macbeth fiercely assumes authority, and Fassbender’s Macbeth becomes both emasculated and unhinged. He cackles under the weight of the crown like a nutter, pacing around in the prison of his palace. Fassbender brings the only true image of love for the Macbeth marriage when Macbeth delivers the climactic musing that life is but a walking shadow as Macbeth hugs the dead body of his wife during the “Out, out, brief candle” speech in the final act. The image of love is fleeting, yet palpably, flickeringly present. 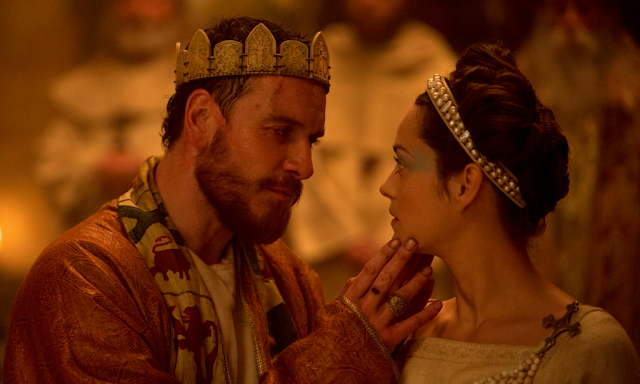 Macbeth opens in Toronto Dec. 11 at TIFF Lightbox. It opens in Ottawa at The ByTowne in January.